Sienese architect, painter, and stage designer, active mainly in Rome, where he settled in 1503. 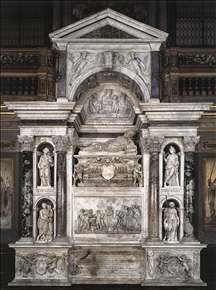 He worked under Bramante on St Peter s, and eventually became architect to the building after Raphael s death in 1520. Amongst High Renaissance architects he ranks almost alongside these two contemporaries, but his style was very different - sophisticated and delicate rather than monumental and grave. In spite of his genius he had little material success, according to Vasari because of his retiring nature . 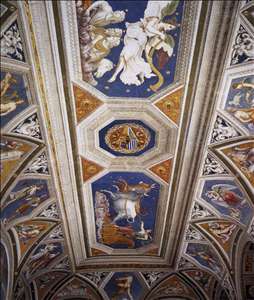 His greatest works - indeed the greatest secular building of the High Renaissance - is the Villa Farnesina (1508-11) in Rome. 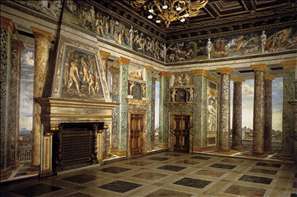 The Farnesina contains decorations by Raphael, Sebastiano del Piombo and Sodoma, as well as Peruzzi s own masterpiece in painting - the Sala delle Prospettive, a brilliant piece of feigned architectural painting that confirms early accounts of his skill in perspective and stage-design. See more details about "Ceiling decoration"
See more details about "Perseus and Medusa"
See more details about "Perspective view of the Sala delle Prospettive"
See more details about "Tomb of Pope Hadrian VI"